"For something a little more light and fun, but still pretty easy." Mix together the light brown sugar, 1 teaspoon of black pepper, thyme, cumin, 1 teaspoon of garlic salt, paprika, chili powder, and nutmeg in a bowl until thoroughly combined. Rub both sides of chicken breasts with the spice mixture, and place into a 9x9-inch baking dish. Sprinkle any remaining seasoning mix on top of chicken, if desired. Bake in the preheated oven until the chicken is lightly browned, no longer pink inside, and the juices run clear, about 30 minutes. An instant-read meat thermometer inserted into the thickest part of a chicken breast should read at least 160 degrees F (70 degrees C). While chicken is baking, bring the rice and water to a boil in a saucepan over high heat. Reduce heat to medium-low, cover, and simmer until the rice is tender, and the liquid has been absorbed, 20 to 25 minutes. Chop half the pineapple slices. 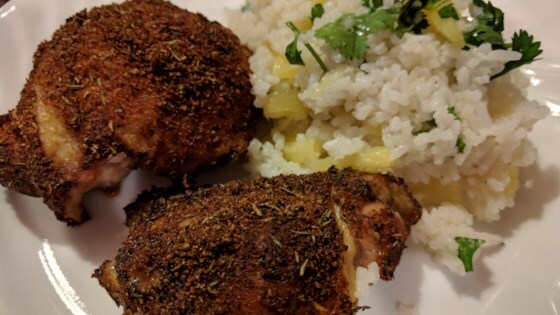 Mix the chopped pineapple, cilantro, and olive oil into the cooked rice, and season to taste with a pinch or two of garlic salt and black pepper. Fluff the rice up with a fork, and transfer to a serving platter. Serve with the baked chicken, topped with remaining pineapple slices. This recipe tasted terrible. Both the rice and chicken were inedible. We tossed out a lot of food tonight! this was awesome...made it 3 times already....my daughter went crazy over the rice too!! !